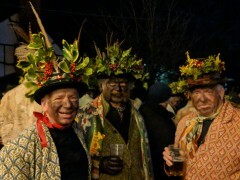 A weekend jaunt to rural Herefordshire to attend the Leominster Morris Wassail in Dilwyn. Got the train to Leominster then a taxi from there to Dilwyn where I attended the Leominster Morris Wassail in the evening. 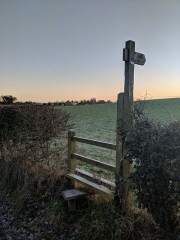 I couldn't get a taxi back to Leominster, it being a Sunday morning, so instead had a 6 or 7 mile walk through the Herefordshire countryside, which turned out to be quite lovely.